This is a recently completed project produced at Hatch Studios Ltd. for Kraft Canada, represented by JWT. The project took approximately 6 weeks to develop with a core staff of approximately 8 people. This was an extremely laborious spot due to the sheer number of characters involved. Not only do we have our four hero characters, but we have an additional 6 secondary characters, some of which are supplementary kids and others which are adults. The animation work required for each scene was therefore substantial and this is excluding any other aspects such cloth, fluid and particle dynamics. As a result of the large number of onscreen characters, rendering also became a problem quickly escalating the polygon count to prohibitive levels. This therefore required rendering to be broken up into various layers, all of which were composited together afterwards with appropriate shadow passes and such. I was very particular regarding the design style and ensured that this would be repeatedly visible throughout the spot. The repetition of swirls which can be seen in the trees, flowers, plants, clouds, and tires, creates a world both fantastic and visually intriguing. The characters feature bold, solid, black lines for arms and legs which contrast their carefully shaded bodies and faces. Global illumination, as per all my projects, was used and pre-calculated irradiance maps were generated for any camera moves, thus effectively eliminating any flickering. A significant amount of color correction was produced in the composite in order to focus our attention on our key characters as well as all color grading and additional effects. 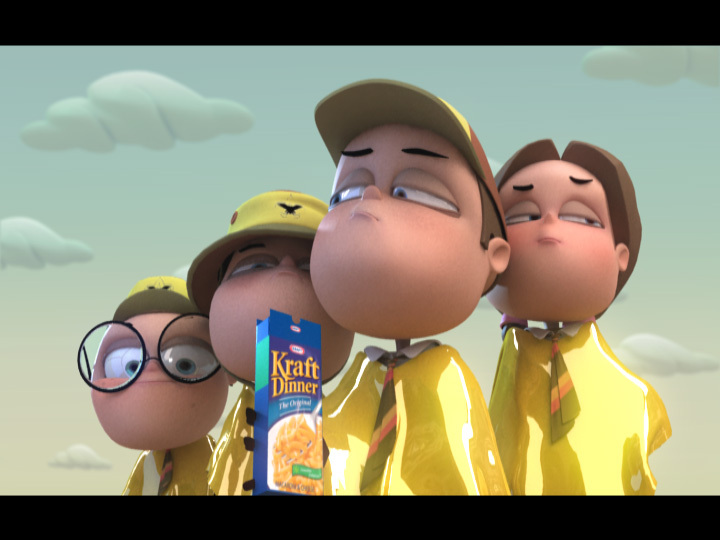 The spot was modeled and animated with 3dsmax 8.0. Background props were modeled with Silo. Lighting and rendering was produced with VRay 1.5 RC3. Compositing was produced with After Effects. Online session was on Inferno.